In Boliver Chanel between Isabela and Fernandina Islands, our scouting area for Monday, I jumped into 60 degree deep water from a Zodiac, underwater camera hanging from my wrist, flippers falling off my feet and swam with Galapagos sea turtles. Now that’s another kind of water sport. Sea turtles, sea lions and Galapagos penguins were as curious about the dozen of us in snorkeling gear and blue wet suits as we were hoping to have a close encounter with them. I was working so hard trying to breathe through the plastic gear and stay within range of the Zodiac yet observing the seaweed, coral and fish-filled domain below while working the underwater camera, that suddenly through my fogged goggles, there was a giant sea turtle swimming close. Not just one, but more than one. A bunch. I had been focusing on schools of sapphire blue fish about the size of anchovies folding back and forth in complete unison and sometimes flashing a silver light as the sun picked up their underbellies. I had hope to avoid an encounter with rather aggressive sea lions - one fellow snorkeler said a sea lion bit at her flippers, and another got penguin poop in his face - but I was ready to take on Galapagos penguins porpoising near the Zodiac. I lasted about a half hour when my gas (me) gave out and re-boarded the Zodiac to shiver in my trusty wet suit in the wind. But it was a good jolt of exercise and I can check off another creature swim in my book. In the morning, we experienced a hard wet landing at Fernandina Island on lava that didn’t dry until we had covered about 100 feet of slippery surfaces being slapped by large swells. Most were complaining as they crept along at the pace of the next holiday. (Good thing they didn’t know that the Volcan La Cumbre is still active on this island and threatens eruption now and then.) Mangrove trees with exposed roots grow here in swamps and the shore line on the calmer side was covered in green algae along with the ever-present, ever curious sally lightfoot crabs. The zone where we were was made up of two kinds of volcanic rock - One with a flat layered effect like a mil fleurs dessert (layers of pancake thin crepes and filling) the other like crumpled up black foil. 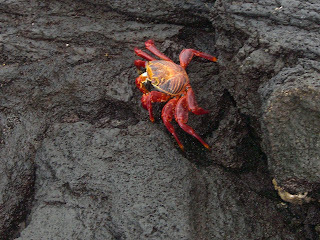 The lava formations among the Galapagos are exactly like Hawaii. The smooth layered lava flow is called "Pa hoe hoe" and the other, where the lava wrinkled up with sharp edges where once gas had escaped is called "a - a." In Hawaiian lore, there was a male rite of passage where he proved his worth by walking over sharp pokes of boiling lava and they’d say "a - a" as they went. Oh well, that’s the story. Although there are no more obvious volcanic eruptions, the guide claimed, the truth is the islands are still forming and moving as the lava plates spread out (these islands formed by volcanos are called "new" because they shook into shape about a million years ago.) And as to weather, it’s rather perfect here, as the rainy season begins, with the same mild temperature every day, being on the equator, which we have crossed four times. One guide proudly pointed out they have no earthquakes, no hurricanes, no tornados, no tsunamis, or disasters from seas - all dueo to the mixture of three wind currents from three directions which meet at Galapagos. But El Nino, when it comes, wreaks devastation on many species of animals, such as the penguins, who suffered almost a genocide in the ninties. 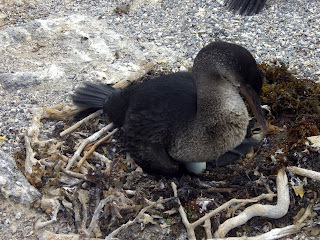 Mother cormorant fixing up her nest. 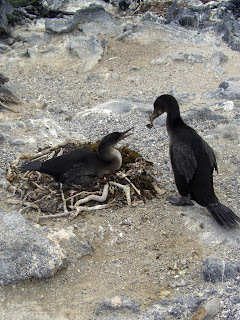 Highlight of this three hour stroll was coming upon a flightless cormorant sitting on her two eggs and decorating her nests with dried seaweed, twigs, and grasses that her baby’s daddy was bringing to spruce it up. It looked like a modern Christmas wreath and had more style than others. Each time he brought something new to the nest, she would stretch her neck upwards, open her long beak, take the gift and then yell at him. Afterwards she quietly move into place the treasure he had just offered to her. I couldn’t tell whether she was ordering more, complaining or thanking him for what he had brought her. Either way, he went searching again. As we walked on, we saw a predator scaur making an attempt to steal the eggs, but we couldn’t interfere. This flightless cormorant is a prime example of Darwin’s theory of evolution - when cormorants first came to Galapagos Islands, there was plenty of food in the sea, so they settled in and didn’t use their flying wings since they could swim to easy nourishment. Over the decades, the wings became as useful as our appendix while their feet began to web big time. Now they cannot fly but breed and behave a lot like penguins, pairing up for the year, but not for life as the penguins do. Their numbers were also devastated by El Nino putting them on the margin of the extinction list. The hit of the afternoon Zodiac (they called it Dinghy) trip was getting close to the rock cliffs that marry the sea in order to see, finally, the blue footed boobies. 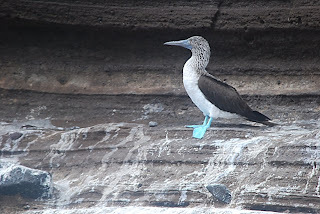 They park on the most trepidous of lava ledges, which they have covered with their bowel movements, and take off from those places to soar above us around and around before literally dive bombing from great heights (like a ten story building) into the sea (they actually go underwater) trying to catch dinner. The guide said they probably get a fish about once in ten dives, but they are persistent, Well, what do you want - their webbed feet are North Carolina tar heel blue. Seriously. Their odd courtship is a lifting of their feet one at a time and waving them in the air. Don’t tar heels do that at ball games? Wow! Those feet are blue! Thanks for your great pictures. I feel as if I'm right there with you.